Although several days have elapsed since my return, I wish to dedicate today's catechesis, as is usual, to the apostolic voyage that I made to the United Nations Organization and the United States of America on April 15-21. First of all, I renew my most heartfelt acknowledgment to the United States Catholic bishops conference and to President Bush for having invited me and for the warm welcome that I was accorded. My 'thank you' extends to all those who, in Washington and New York, came to greet me and to show their love for the Pope, or who accompanied and sustained me with prayer and offering their sacrifices. As you know, the occasion for the visit was the bicentennnial of the elevation to a metropolitan see of the country'[s first diocese, Baltimore, and the foundation of the dioceses of New York, Boston, Philadelphia and Louisville. On such an ecclesial occasion, I had the joy of coming, for the first time as the Successor of Peter, to visit the beloved people of the United States of America, to confirm Catholics in their faith, to renew and increase fraternity with all Christians, and to announce to all the message of 'Christ our Hope', which was the theme of the visit. In the meeting with the President at his residence, I paid tribute to that great nation which, from its beginnings, was founded on the basis of a happy conjunction between religious, eethical and political principles, and which still constitutes a valid example of healthy secularity, where the religious dimension, in the diversity of its expressions, is not only tolerated but valued as the 'spirit' of the nation and the fundamental guarantee of human rights and responsibilities. In such context, the Church can develop with freedom and commitment its mission of evangelization and human promotion, and even of being a 'critical conscience', contributing to the construction of a society worthy of the human being, and at the same time, stimulating a nation like the United States - which everyone looks to as one of the principal actors on the international scene - towards global solidarity, which is ever more necessry and urgent, and towards the patient exercise of dialog in international relations. Naturally, the mission and the role of the church community were at the center of my encounter with the bishops at the National Shrine of the Immaculate Conception in Washington. In the liturgical context of Vespers, we praised the Lord for the path taken by the People of God in the United States, for the zeal of its pastors, and the fervor and generosity of its faithful, manifested in their high and open regard for the faith, and in innumerable charitable and humanitarian initiatives within the country and abroad. At the same time, I sustained my brother bishops in their not-easy task of sowing the Gospel in a society marked by not a few contradictions which threatens the coherence of Catholics and even the clergy themselves. I encouraged them to make their voices heard on actual moral and social questions and to form faithful lay persons in such a way that they may be good 'yeast' for the civilian community, starting with the fundamental cell of society which is the family. In this sense, I exhorted them to re-propose the sacrmament of Matrimony as a gift and an indissoluble commitment between a man and a woman, the natural environment for nurturing and educating children. The Church and the family, together with schools - especially those of Christian inspiration - should cooperate to offer young people a solid moral education. But in this task, those who work in communications and entertainment also have a great responsibility. Thinking of the sorrowful events of sexual abuses committes by ordained ministers against minors, I wished to express to the bishops my closeness, encouraging them in the committment to bind up the wounds and to strengthen their relationship with their priests. Responding to some questions posed by the bishops, I was able to underline some important aspects: the intrinsic relationship between the Gospel and 'natural law'; a sane concept of freedom with includes love and is realized in love; the ecclesial dimension of the Christian experience; the exigency of announcing in a new way, especially to young people, 'salvation' as the fullness of living, and to educate them in prayer, from which generous responses to the call of the Lord may germinate. In the great festive Eucharistic celebration at the Nationals Park Stadium of Washington, we invoked the Holy Spirit on the entire Church in the United States of America, so that, firmly rooted in the faith transmitted by their fathers, profoundly united and renewed, it may face present and future challenges with courage and hope - that hope which "does not disappoint, because the love of God has been poured out into our hearts through the Holy Spirit that has been given to us" (Rm 5,5). One such challenge is certainly that of education, and therefore, at the Catholic University of America, I met the rectors of Catholic universities and colleges, the diocesan officials responsible for teaching, professors and student rerpresenatives. The educational task is an integral part of the mission of the Church, and the ecclesial community in the United States has always been very engaged in it, rendering at the same time a great social and cultural service to the entire nation. It is important that this goes on. It is equally important to look after the quality of Catholic institutions, so that they may truly be able to form students according to 'the full stature' of Christ (cfr Eph 4,13), uniting faith and reason, freedom and truth. It was with joy that I confirmed the educators in this, their precious task of intellectual charity. In a multicultural country like the United States of America, my meetings with the representatives of other religions were especially important: in Washington at the John Paul II Cultural Center, with Jews, Muslims, Hindus, Buddhists and Jains; in New York, the visit to a synagogue. These were very heartfelt moments, especially the latter, which confirmed a common commitment to dialog and to the promotion of peace and spiritual and moral values. In that nation which may be called the homeland of religious freedom, I wished to underscore that this must always be defended with united efforts to avoid any form of discrimination or prejudice. And I pointed to the great responsibility of religious leaders, both in teaching respect and non-violence as well as in keeping alive the most profound questions of the human mind. The ecumenical celebration in the parish church of St. Joseph was likewise characterized by great cordiality. Together we prayed to the Lord so that he may increase in Christians the capacity to give reason - especially with increasing unity - for the great hope that is in us (cfr 1 Pt 3,15) through our common faith in Jesus Christ. Another principal objective for my trip was the visit to the central headquarters of the Untied Nations Organization - the fourth by a Pope, after that of Paul VI in 1965 and John Paul II's two visits in 1979 and in 1995. On the occasion of the 60th anniversary of the Universal Declaration of Human Rights, Providence gave me the opportunity to confirm, in the widest and most authoritative [forum for] universal consensus, the value of that declaration, recalling its universal basis, namely, the dignity of the human being, created by God in his image and likeness, in order to cooperate on earth with his great design of life and peace. Like peace, even respect for human rights is rooted in 'justice' - that is to say, an ethical order that is valid for all times and for all peoples, that can be summarized in the famous maxim, "Do not do to others what you do not wish done to you", or expressed positively in the words of Jesus: "Do to others whatever you would have them do to you." (Mt 7,12). On this basis, which constitutes the typical contribution of the Holy See to the United Nations, I renewed - and even today, I renew - the concrete commitment of the Catholic Church to contribute to the strengthening of international relations that are imprinted with the principles of responsibility and solidarity. Also firmly impressed in my spirit are other moments of my stay in New York. At St. Patrick's Cathedral, in the heart of Manhattan - truly a 'house of prayer for all people' - I celebrated the Holy Mass for priests and consecrated persons who came from every part of the counhtry. I will never forget the warmth with which they wished me well on the third anniversary of my election to Peter's Chair. It was a moving moment, during which I directly experienced - in sensory form - the support of the entire Church for my ministry. I can say the same for my meeting with the young people and seminarians which took place in the diocesan seminary, preceded by a very significant visit among handicapped children and youths, along with their families. To the young people, by nature thirsting for truth and love, I proposed the example of some men and women who testified in exemplary manner on Amerian soil to the Gospel of truth which gives us freedom to love and to serve in a life spent for others. Facing the shadows which threaten their lives today, the youth may find in the saints the light which disperses these shadows: the light of Christ, hope for every man! This hope, stronger than sin or death, also inspired the emotion-charged moments which I spent in silence at the vortex of Ground Zero, where I lit a candle and prayed for all the victims of that terrible tragedy. Finally, my visit culminated in the Eucharistic celebration at New York's Yankee Stadium. I still carry in my heart that feast of faith and fraternity with which we celebrated the bicentennials of North America's oldest dioceses. The small flock from those beginnnings has developed enormously, enriching itself in faith and with the traditions of successive immigrant waves. To that Church, which is facing the challenges of today, I had the joy of announcing once more "Christ our Hope" -yesterday, today and always. Dear brothers and sisters, I ask you to join me in giving thanks for the comforting success of this apostolic voyage and in asking God, through the intercession of the Virgin Mary, that it may produce abundant fruits for the Church in America and in all parts of the world. Holy Father accepts the resignation of the much maligned bishop. 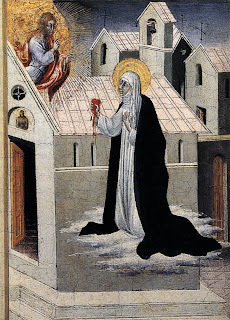 It is evident, I think, that today’s feast of Saint Catherine of Siena is a further invitation, a pressing exhortation, to fix our gaze on the Blood of the Lamb, to adore that Precious Blood, to yield every impurity and sin of ours to the torrent that gushes from Christ’s pierced side, and to drink of the Chalice of Salvation. Saint Catherine is one of the great blazing mystics of the Blood. One could also speak of Julian of Norwich and, again, of Blessed Marie of the Incarnation. The Blood of Christ is sprinkled over every page of Catherine’s writings. The Blood of Christ opens and seals her correspondence. The Blood of Christ is on her lips and in her heart. For Catherine, that Blood is a Divine Fire. It is the remedy for every ill: medicine for a Church in crisis, purity for a priesthood fallen into the filth of the world, strength for the weak, hope for the despondent, healing for the sick. For Catherine, the Blood of Christ is the power by which lives are changed, by which sinners become saints, by which monasteries are reformed. The Blood of the Lamb is given us in the sacraments. In the Sacrament of Penance, the Blood of Christ is applied to the wounds of the soul. “The Blood of Christ cleanses us from all sin” (1 Jn 1:7). The Blood of Christ bathes the soul, cleansing of it of every trace of sin and making it resplendent in the eyes of the Father. In the Most Holy Eucharist, the Blood of Christ is given us as the fountain of immortality, the antidote for every poison of body, mind, and soul, an infusion of divine joy in this valley of tears. This was the experience of Saint Catherine and, because it was her experience, it became her teaching. Even more, it became the cry of her heart to all who would listen. The Precious Blood of Christ is among those heavenly mysteries “hidden from the wise and understanding and revealed to infants” (Mt 11:25). The mystery of the Blood is revealed to those who taste it with the palate of the soul, to those who approach the holy Chalice with the fear of God and with faith. One’s dying words are not improvised. They are the expression of a lifetime. Saint Catherine, having lived immersed in Blood of Christ, died with the Blood of Christ on her lips. On the January 30th before her death, she prayed for the Church, the Bride of Christ: “O Eternal God, accept the sacrifice of my life within this Mystic Body of holy Church. I have nothing to give but what you have given me. Take my heart, then, and squeeze it out over this Bride’s face.” For His Heart’s Blood, she gave her heart’s blood and, like her Bridegroom and Lord, she gave it for the Church. but only with your mercy. in virtue of your Son’s most sweet Blood. Q: Can you explain your involvement in that unannounced meeting in Washington that brought together the Holy Father with five local victims of sexual abuse by clergy? A: After it was announced that the Holy Father was going to Washington and New York and that Boston was not included, the bishops of the region joined me in writing a letter to the Holy Father asking him to reconsider and talking about the pastoral needs that we have in New England. Then the response came back that, given the very taxing nature of the trip, that they (Vatican officials) really hesitated to add anything else. So I wrote back again asking if the Holy Father would meet with victims and after that the Holy Father responded and asked me to make the necessary arrangements. Q: Why was this meeting not part of the official schedule? A: We did our best to keep it a very discreet meeting because we did not want to turn it a media circus and we were afraid that if people found ahead of time that that was just what would happen. Also, some of the survivors who accompanied us wished to remain anonymous and it would have made it impossible for them to participate under the public scrutiny. So, I am just thankful that we were able to carry it off without becoming public before hand. I was very grateful to the Holy Father. The many times he addressed the sexual abuse crisis indicate how deeply he understands the situation of our Church and what happens here. He obviously feels a great sorrow over what has happened and that he is ashamed but, at the same time, wants to encourage us on the path to healing and reconciliation. At the Thursday morning Mass at the Nationals’ stadium he talked about the need of giving pastoral care to the victims, and then in the afternoon he gave us a very concrete example of that in his own encounter with them. Q: Why do you think this was a crucial meeting? A: I think it was important for the victims to feel as though they had access to the Holy Father. Obviously, not all victims but someone representing them and in a small enough group, in a context that it would allow for a very personal interchange between the Holy Father and the victims. It was not a formal address; the Holy Father made his initial comments and then he spoke with each of the victims individually, he clasped their hands, he blessed them, he prayed with them. I think for the Holy Father, pastorally, it was very important to experience this. Certainly he has heard through the bishops and through others the devastation of sexual abuse but it is another thing to encounter personally the survivors and to learn first hand of their suffering and pain. "Today many Eastern Churches, following the Julian Calendar, celebrate the great solemnity of Easter. I would like to express my fraternal spiritual nearness to these brothers and sisters of ours. "I cordially greet them, praying that the God who is one and three will confirm them in the faith, fill them with the splendorous light that emanates from the resurrection of the Lord and to comfort them in the difficult situations that they often find themselves living and witnessing to the Gospel." He continued, "I invite all to join with me in invoking the Mother of God, that the road of dialogue and collaboration that was started upon sometime ago will soon lead to a more complete communion among all the disciples of Christ, that they may be a luminous sign of hope for all humanity." The Council of Nicaea established that the day of Easter should fall on the first Sunday after the first full moon following the vernal equinox. The difference of dates for the Catholic and Orthodox Churches is due to fact that they follow different calendars. The Catholic Church, following the Gregorian calendar, normally celebrates Easter earlier than the Eastern Churches, which are mainly Orthodox, that follow the Julian calendar. Last year the two coincided with the celebration of Easter on April 8. A prayer card commemorating the papal visit made right here in northeast Indiana. The 50-thousand-plus people who attended mass this morning at the Washington stadium, each took one home. The prayer cards were made by the 'Our Sunday Visitor' publishing company, located in Huntington, Indiana. The cards have a picture of pope benedict the 16th on the front and a quote from the holy leader on the back. Our Sunday Visitor' is one of the most-read catholic publications in the country, with more than 300-thousand households receiving it. The paper's publisher says they've had the prayer cards ready to go since January. He thinks the pope's visit and material like this will help excite Catholics and non-Catholics alike about the faith. 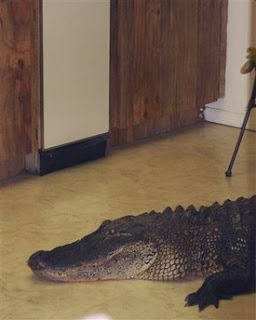 Greg Erlandson/Publisher. 'Our Sunday Visitor': "Truthfully what we are asking is how can we serve the Church and make this visit a success. Particularly, in this case, where you have various conservatoires, you've got the death threats from Osama Bin Laden, all these issues. I think praying for the success of the visit was really important. I mean if we really say what we are about, than we should start praying for the success. And, I think most Catholics have been." 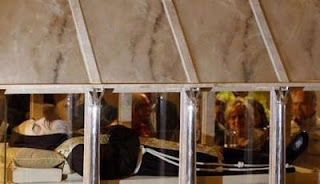 The body of the popular Italian saint, Padre Pio, has gone on display in a glass coffin in southern Italy. Padre Pio was said to have had stigmata, or bleeding wounds of Jesus, on his hands and feet. His body was exhumed in March on the 40th anniversary of his death. He was canonised by Pope John Paul II in 2002. More than a million people are expected this year to see his body, which is said to be well-preserved. But there is reportedly no sign of the stigmata. Today’s first reading, taken from the Acts of the Apostles, speaks of linguistic and cultural tensions already present within the earliest Church community. At the same time, it shows the power of the word of God, authoritatively proclaimed by the Apostles and received in faith, to create a unity which transcends the divisions arising from human limitations and weakness. Here we are reminded of a fundamental truth: that the Church’s unity has no other basis than the Word of God, made flesh in Christ Jesus our Lord. All external signs of identity, all structures, associations and programs, valuable or even essential as they may be, ultimately exist only to support and foster the deeper unity which, in Christ, is God’s indefectible gift to his Church. Bryant Gumble has been let go by the NFL network--much to the joy of those who've endured his laid back, mistake filled analysis for the past two football seasons. Danica Patrick won the IRL race last night in Japan--becoming the first woman ever to win a major auto race! My own years as a teenager were marred by a sinister regime that thought it had all the answers; its influence grew – infiltrating schools and civic bodies, as well as politics and even religion – before it was fully recognized for the monster it was. It banished God and thus became impervious to anything true and good. Many of your grandparents and great-grandparents will have recounted the horror of the destruction that ensued. Indeed, some of them came to America precisely to escape such terror. Let us thank God that today many people of your generation are able to enjoy the liberties which have arisen through the extension of democracy and respect for human rights. Let us thank God for all those who strive to ensure that you can grow up in an environment that nurtures what is beautiful, good, and true: your parents and grandparents, your teachers and priests, those civic leaders who seek what is right and just. What might that darkness be? What happens when people, especially the most vulnerable, encounter a clenched fist of repression or manipulation rather than a hand of hope? A first group of examples pertains to the heart. Here, the dreams and longings that young people pursue can so easily be shattered or destroyed. I am thinking of those affected by drug and substance abuse, homelessness and poverty, racism, violence, and degradation – especially of girls and women. While the causes of these problems are complex, all have in common a poisoned attitude of mind which results in people being treated as mere objects ─ a callousness of heart takes hold which first ignores, then ridicules, the God-given dignity of every human being. Such tragedies also point to what might have been and what could be, were there other hands – your hands – reaching out. I encourage you to invite others, especially the vulnerable and the innocent, to join you along the way of goodness and hope. The second area of darkness – that which affects the mind – often goes unnoticed, and for this reason is particularly sinister. The manipulation of truth distorts our perception of reality, and tarnishes our imagination and aspirations. I have already mentioned the many liberties which you are fortunate enough to enjoy. The fundamental importance of freedom must be rigorously safeguarded. It is no surprise then that numerous individuals and groups vociferously claim their freedom in the public forum. Yet freedom is a delicate value. It can be misunderstood or misused so as to lead not to the happiness which we all expect it to yield, but to a dark arena of manipulation in which our understanding of self and the world becomes confused, or even distorted by those who have an ulterior agenda. For all of us, I think, one of the great disappointments which followed the Second Vatican Council, with its call for a greater engagement in the Church’s mission to the world, has been the experience of division between different groups, different generations, different members of the same religious family. We can only move forward if we turn our gaze together to Christ! In the light of faith, we will then discover the wisdom and strength needed to open ourselves to points of view which may not necessarily conform to our own ideas or assumptions. Thus we can value the perspectives of others, be they younger or older than ourselves, and ultimately hear “what the Spirit is saying” to us and to the Church (cf. Rev 2:7). In this way, we will move together towards that true spiritual renewal desired by the Council, a renewal which can only strengthen the Church in that holiness and unity indispensable for the effective proclamation of the Gospel in today’s world. Benedict’s trip has been a surprise for me. To be honest, I was one of those (many) liberal Catholics who was disappointed by his election. (At the time, I told someone that when Pope Benedict XVI first stepped onto the Vatican balcony after his election, I felt like jumping off of one!) In his previous role as prefect of the Congregation of the Doctrine of the Faith, charged with serving as the church’s theological watchdog, it was his job to ensure doctrinal purity, especially among theologians. During his many years in that position, he disciplined many good scholars and writers, even some of my friends, who were doing their best to advance Catholic theology. When Pope Benedict XVI met with Catholic educators yesterday, he used the occasion to warn them of the limits of academic freedom in Catholic schools. “Any appeal to the principle of academic freedom in order to justify positions that contradict the faith and the teaching of the church would obstruct and even betray the university’s identity and mission,” he said. These words should be put in the context of the Pope’s former job as head of the Congregation for the Doctrine of the Faith (formerly the Inquisition). 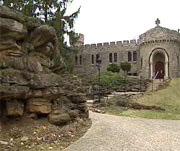 During the 25 years when he headed this office (1981-2005), Cardinal Ratzinger cracked down on progressive Catholic thought, closed down seminaries dedicated to educating priests in the context of the issues of poverty and injustice, and, again and again, progressive bishops were replaced with conservative ones. Let us trust in the Spirit’s power to inspire conversion, to heal every wound, to overcome every division, and to inspire new life and freedom. How much we need these gifts! There is a need for all of us to move beyond sterile divisions, disagreements and preconceptions, and to listen together to the voice of the Spirit who is guiding the Church into a future of hope. A crowd of 46,000 is expected, and the demand for tickets doubled the supply, organizers said. Barbara and Michael Loh of Williamsburg, Va., sat alone in the stands taking in the scene. They were among the first to arrive. "I've been Catholic all my life and ... my dream has always been to see the pope," said Barbara Loh, tearing up. At 5:45 a.m., more than four hours before the Mass, it was standing-room only on Metro trains. Vendors hawked Vatican flags and souvenir buttons, but there were few takers as people hurried toward the stadium. For others, there was nothing more important than getting in, and many people without tickets stood outside the Metro station with signs pleading for extras. It is your God-given responsibility as pastors to bind up the wounds caused by every breach of trust, to foster healing, to promote reconciliation and to reach out with loving concern to those so seriously wronged. ...the subtle influence of secularism can nevertheless color the way people allow their faith to influence their behavior. Is it consistent to profess our beliefs in church on Sunday, and then during the week to promote business practices or medical procedures contrary to those beliefs? Is it consistent for practicing Catholics to ignore or exploit the poor and the marginalized, to promote sexual behavior contrary to Catholic moral teaching, or to adopt positions that contradict the right to life of every human being from conception to natural death? Any tendency to treat religion as a private matter must be resisted. Only when their faith permeates every aspect of their lives do Christians become truly open to the transforming power of the Gospel. a further obstacle to an encounter with the living God lies in the subtle influence of materialism, which can all too easily focus the attention on the hundredfold, which God promises now in this time, at the expense of the eternal life which he promises in the age to come (cf. Mk 10:30). People today need to be reminded of the ultimate purpose of their lives. They need to recognize that implanted within them is a deep thirst for God. They need to be given opportunities to drink from the wells of his infinite love. It is easy to be entranced by the almost unlimited possibilities that science and technology place before us; it is easy to make the mistake of thinking we can obtain by our own efforts the fulfillment of our deepest needs. This is an illusion. Without God, who alone bestows upon us what we by ourselves cannot attain (cf. Spe Salvi, 31), our lives are ultimately empty. People need to be constantly reminded to cultivate a relationship with him who came that we might have life in abundance (cf. Jn 10:10). The goal of all our pastoral and catechetical work, the object of our preaching, and the focus of our sacramental ministry should be to help people establish and nurture that living relationship with “Christ Jesus, our hope” (1 Tim 1:1). giving rise to a form of piety which sometimes emphasizes our private relationship with God at the expense of our calling to be members of a redeemed community. Yet from the beginning, God saw that “it is not good for man to be alone” (Gen 2:18). We were created as social beings who find fulfillment only in love - for God and for our neighbor. If we are truly to gaze upon him who is the source of our joy, we need to do so as members of the people of God (cf. Spe Salvi, 14). If this seems counter-cultural, that is simply further evidence of the urgent need for a renewed evangelization of culture. metropolitan Archdiocese, and the establishment of the Sees of New York, Boston, Philadelphia and Louisville. Yet I am happy to be here as a guest of all Americans. beliefs were a constant inspiration and driving force, as for example in the struggle against slavery and in the civil rights movement. In our time too, particularly in moments of crisis, Americans continue to find their strength in a commitment to this patrimony of shared ideals and aspirations. I am confident that the American people will find in their religious beliefs a precious source of insight and an inspiration to pursue reasoned, responsible and respectful dialogue in the effort to build a more humane and free society. represent “indispensable supports” of political prosperity. leaders and those whom they represent are guided by truth and bring the wisdom born of firm moral principle to decisions affecting the life and future of the nation. cherished, protected and effectively advanced. as I begin my visit to the United States, I express once more my gratitude for your invitation, my joy to be in your midst, and my fervent prayers that Almighty God will confirm this nation and its people in the ways of justice, prosperity and peace. Pope Benedict XVI said Tuesday he was "deeply ashamed" of the clergy sexual abuse scandal in the Catholic church and will work to make sure pedophiles don't become priests. Benedict was answering questions submitted in advance by reporters aboard a special Alitalia airliner as he was flying from Rome to Washington to begin his first papal pilgrimage to the United States. "It is a great suffering for the Church in the United States and for the Church in general and for me personally that this could happen," Benedict said. "It is difficult for me to understand how it was possible that priests betray in this way their mission ... to these children." "I am deeply ashamed and we will do what is possible so this cannot happen again in the future," the pope said. 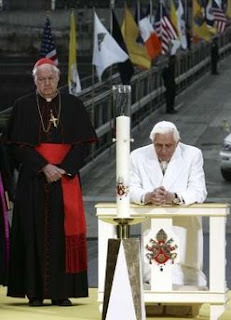 Benedict pledged that pedophiles would not be priests in the Roman Catholic church. "We will absolutely exclude pedophiles from the sacred ministry," Benedict said in English. "It is more important to have good priests than many priests. We will do everything possible to heal this wound." Benedict's pilgrimage was the first trip by a pontiff to the United States since the scandal involving priests sexually abusing young people rocked U.S. dioceses and triggered lawsuits that have cost the Church hundreds of millions of dollars in settlements. 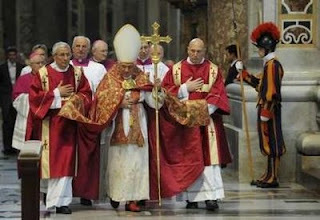 Pedophilia is "absolutely incompatible" with the priesthood," Benedict said. Vatican officials selected four questions to be read by the journalists to the pontiff aboard the plane. Benedict described his pilgrimage as a journey to meet a "great people and a great Church." He spoke about the American model of religious values within a system of separation of church and state. From a presidential welcome, to two Masses at baseball stadiums, to a stop for prayer at ground zero in New York, Benedict will get a heavy dose of the American experience. President Bush planned to make the unusual gesture of greeting him at Andrews Air Force Base — the first time the president has greeted a foreign leader there. The pope said he will discuss immigration with Bush, including the difficulties of families who are separated by immigration. When I first read The Journals of Father Alexander Schmemann, 1973-1983, about eight years ago, I was struck by Father Schmemann's commentary on the Masses celebrated in Yankee Stadium by Pope Paul VI in 1965 and by Pope John Paul II in 1979. The boldface is my own. Father Schmemann asks some hard questions. The Pope of Rome is in New York. We watched him on television in Yankee Stadium. A mixed impression. On one hand, an unquestionably good man and full of light. Wonderful smile. Very genuine — a man of God. But, on the other hand, there are some "buts"! First of all, the Mass itself. The first impression is how liturgically impoverished the Catholic Church has become. In 1965, I watched the service performed by Pope Paul VI in the same Yankee Stadium. Despite everything, it was the presence, the appearance on earth of the eternal, the "super earthly. Whereas yesterday I had the feeling that the main thing was the "message." This message is, again and again, "peace and justice," "human family," "social work," etc. An opportunity was given, a fantastic chance to tell millions and millions of people about God, to reveal to them that more than anything else they need God! But here, on the contrary, the whole goal, it seemed, consisted in proving that the Church also can speak the jargon of the United Nations. All the symbols point the same way: the reading of the Scriptures by some lay people with bright ties, etc. And a horrible translation: I never suspected that a translation could be a heresy: Grace — "abiding love"! Crowds — their joy and excitement. Quite genuine, but at the same time, it is clear that there is an element of mass psychosis. 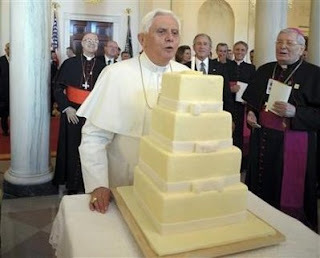 "Peoples' Pope . . ." What does this really mean? I don't know. I am not sure. Does one have to serve Mass in Yankee Stadium? But if it's possible and needed, shouldn't the Mass be, so to say, "super-earthly," separated from the secular world, in order to show in the world — the Kingdom of God? 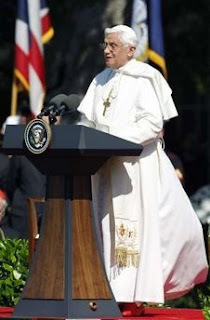 I'm revisiting these posts of a few years ago, ( Why "When ‘Ratzinger’ was a Swear Word"? and Where ‘Ratzinger" Was a Swear Word), well, because if you want to understand the hodge podge reporting you'll hear about the Pope's visit, many of you need a little background here. You see, there was a time, in the not too distant past when in theological schools in the country (outside a the few orthodox ones), that if you mentioned the name "ratzinger" in anyway other than a sneer--you would have been considered as something of a kook. I readily admit that I didn't question this much at the time, I was rather amused at it--how threatened teachers of theology would become when anyone mentioned The Ratzinger Report or any of the other Cardinal's writings, but not sufficiently motivated to actually read the Cardinal's writings myself and discover what they were so scared of--all of that has changed in the past three years--when I have devoured everything Ratzinger that I can get my hands on--and now I get it. This man, now Pope Benedict XVI understands every crackpot theology that has infiltrated the Church in the past forty years and has convincing answers for everyone of them and unlike many of these so called theologies (so called because "theo", i.e. God is missing from most of them), this man Pope Benedict XVI and theologians of his ilk have given us Jesus Christ for those of us living in the twenty-first century. Benedict is no conservative in the sense that the term is often thrown around--he has presented us with a new theology--a new way of understanding our faith that is a corrective break from the pre-Vatican II church. Jesus Christ is at the center of this faith--the Scriptures are central to this presentation and the way of the early Church Fathers is resurrected. How is this different from the post Vatican school where "ratzinger" was a swear word? Well there, man and woman are the center, experience is central to the presentation and the Scriptures are used at the service of this experience. So there is no truth, no call from what I am to what I must become--just the way things as they are and how that's okay with God, thus theology becomes liberation, feminist, etc. Give theology an adjective and you are no longer talking about God with a big "G" but an idolatry. Recalling that the Pauline year will begin on June 28, to celebrate the two thousandth anniversary of the birth of the apostle Paul, "the missionary par excellence", among the vocations the pope first of all cited "missionaries ad vitam, meaning those men and women who dedicate themselves completely to proclaiming Christ to those who still do not know him: this vocation still maintains its full validity". Benedict XVI emphasised that there is above all a need for missionary priests, who dispense "the Word of God and the Sacraments, manifesting to all with their pastoral charity, above all to the sick, to the least, to the poor, the healing presence of Jesus Christ". In the donation of their lives to their brothers, they often encounter martyrdom. The pontiff recalled that two religious died yesterday, in Kenya and in Guinea. "Let us pray also", the pope added, "that the ranks may grow continually of those who decide to live the Gospel radically through the vows of chastity, poverty, and obedience: these are men and women who have a primary role in evangelisation. Of them, some dedicate themselves to contemplation and to prayer, others to various forms of educational and charitable action, but all are united by the same goal: that of bearing witness to the primacy of God over all, and of spreading his Kingdom in every realm of society". Mission is the heart not only of consecrated vocations, but also of the vocation to matrimony: "Spouses, in fact, are called to live the Gospel in their families, in their places of work, in their parish and civil communities. In certain cases, moreover, they offer their precious collaboration in the mission ad gentes". The other concern of the pope is that of a request for prayer for his upcoming visit to the United States, from April 15-20. Invoking "the maternal protection of Mary over the many vocations existing in the Church, that they may develop with a strong missionary imprint", Benedict XVI also entrusted to Mary "the special missionary experience" that he will have in the coming days "with the apostolic voyage to the United States of America, and the visit to the UN". "I ask all of you", he concluded "to accompany me with your prayer". After the Marian prayer, in the greetings in various languages, he exhorted the young people to "listen to the call of the Good Shepherd", and to follow him in a radical way, in order to be "truly happy". He asked all to pray for his "apostolic pilgrimage" to the United States. The "true humanism" of Saint Benedict, which means a journey toward God, remains today an antidote against the culture of the "easy and egocentric" self-realisation of man, a temptation "that is often exalted today", in a Europe that "just having left behind a century profoundly wounded by two world wars, and after the collapse of the grand ideologies, revealed as tragic utopias, is searching for its identity". The figure of the founder of Western monasticism, "and also the patron of my pontificate", was at the centre of the reflection that Benedict XVI presented today to the 30,000 people in Saint Peter's Square for the general audience, the last before his departure for his visit to the United States, on April 15. Today's address brought his expression of the hope that "Europe may be enlightened by the religious and moral teaching that emerges from its Christian roots", which was expanded to the vision of the Benedictine rule as a model for all men of today, since by his life Saint Benedict "demonstrates that God is not a faraway hypothesis about the origin of the world, but a concrete presence in the life of man". Thus, on the Old Continent, "in order to create a new and lasting unity, political, economic, and legal instruments are certainly important, but there is also the need for a spiritual and ethical renewal that draws upon the Christian roots of the continent, otherwise Europe cannot be rebuilt. Without this vital sap", he continued, "man is exposed to the risk of succumbing and of wanting to redeem himself". This is "a utopia that in various ways, as Pope John Paul II showed, represents an unprecedented step backward in tumultuous history of humanity". The pope then recalled that Saint Benedict, who was born around the year 480, was sent by his prosperous parents to study in Rome. But, "disgusted by the lifestyle of many of his companions", and not wanting to fall into the same errors, but "to please God alone", he withdrew to the mountains east of Rome, before his studies were concluded. During the three years when he lived as a hermit in a cave near Subiaco, he experienced a period of "solitude together with God". That period allowed him to overcome three fundamental temptations: that of self-affirmation, of placing himself at the centre, that of sexuality, and that of anger and vengeance". "In the anxiety and confusion of his time", caused by the fall of the Roman Empire and by the crisis in public behaviour, "he lived under the eyes of God, and with his own eyes directed toward him, without losing sight of man and his concrete problems". "Thus he understood the reality of man and his mission". The pope then emphasised St Benedict's life of prayer, which for him was "in the first place an act of listening, which must then be translated into concrete action. The Lord is waiting for us to respond practically, every day, to his holy instruction". The rule of St Benedict, in conclusion, is still today "a light along humanity's path", and is "the search for the humble and obedient Christ", and precisely in this way is at the service of the other and of peace. ...At 70 percent approval, a significant majority of respondents believe Benedict is doing a good job leading the church, said Matthew Loveland, a sociologist of religion at Le Moyne who works with the Le Moyne/Zogby poll. The How to Book of the Mass by Michael Dubruiel would be a great gift for an inquirer. Together with your Bishops, I have chosen as the theme of my journey three simple but essential words: "Christ our hope". Following in the footsteps of my venerable predecessors, Paul VI and John Paul II, I shall come to United States of America as Pope for the first time, to proclaim this great truth: Jesus Christ is hope for men and women of every language, race, culture and social condition. Yes, Christ is the face of God present among us. Through him, our lives reach fullness, and together, both as individuals and peoples, we can become a family united by fraternal love, according to the eternal plan of God the Father. I know how deeply rooted this Gospel message is in your country. I am coming to share it with you, in a series of celebrations and gatherings. I shall also bring the message of Christian hope to the great Assembly of the United Nations, to the representatives of all the peoples of the world. Indeed, the world has greater need of hope than ever: hope for peace, for justice, and for freedom, but this hope can never be fulfilled without obedience to the law of God, which Christ brought to fulfilment in the commandment to love one another. Do to others as you would have them do to you, and avoid doing what you would not want them to do. This "golden rule" is given in the Bible, but it is valid for all people, including non-believers. It is the law written on the human heart; on this we can all agree, so that when we come to address other matters we can do so in a positive and constructive manner for the entire human community.